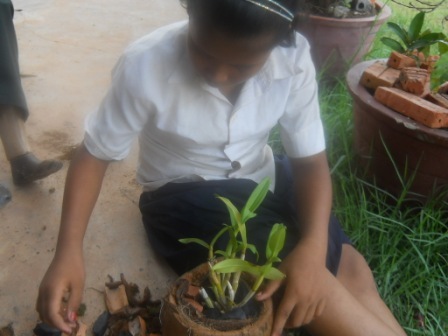 Long Nit, age 15, lives with her sister and grandmother in this house near Siem Reap. Both sister are HIV+, lost their parents to AIDS, and have fallen many grades behind in school as they struggle to find money just to feed themselves. 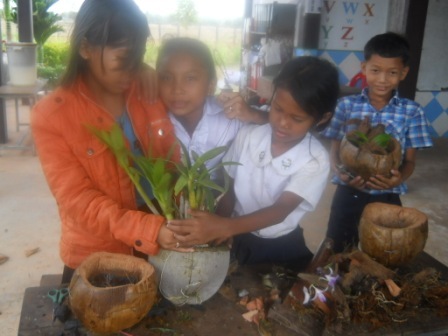 The F2F Siem Reap Center began working with Nit 2 years ago - since then, we've seen Nit advance to grade 5, we've introduced her to traditional music and dance, and we've even helped her discover a love of growing orchids. Nit has also grained confidence in the possibilities for the future - not just for herself, but for her family and her community as well. That's why Nit is now our youth group president. The future for the poor in Cambodia may be even more challenging than in Malawi, as social norms and systematic corruption here can feel overwhelming. Few Cambodians feel they can change the system - but if anyone can, it will be young leaders like Long Nit, who are beginning to see that their future depends on their self-reliance. Helping people help themselves - that's what F2F is all about. This is my last dispatch as I head toward home - along the way, I'll be stopping in Tokyo for meetings with the former Japanese ambassador to Cambodia and the current Malawi ambassador to Japan and Australia. Wish me luck that they may see the value and impact of what F2F is doing. Thank you, our friends and supporters, for letting me share my F2F experiences with you these past 6 weeks. It's been a privilege to do so.